Rockville, MD (July 7, 2014) – Intervise, a leading IT consulting company for the federal government, announced today that Intervise CEO Michael Priddy has been awarded the Educational Foundation Special Award of Merit from Armed Forces Communications and Electronics Association (AFCEA) International. 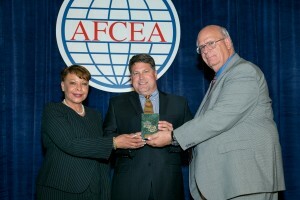 The merit award recognizes the exceptional commitment on the part of individuals who are dedicated to the mission of AFCEA education. As Vice President of Education for AFCEA Bethesda for the past four years, Priddy has paved new ground in advancing STEM education, including the development of grant programs to assist minorities and girls in pursuing technical degrees, promoting interest in STEM to over 250 middle school students, and using his experience in collaborating with university partners and grantees to create a pathway from Middle School to Baccalaureate STEM programs. Additionally, as part of the award ceremony, the AFCEA Bethesda chapter won the prestigious Harry C. Ingles Award in the very large category, an award bestowed upon chapters that have most significantly contributed to the goals of AFCEA and two additional AFCEA Bethesda members were also recognized for their dedicated individual support of the AFCEA mission.